If the chance to take the longest cable car ride in the world, view a giant dragon-shaped steel bridge breathe fire (really! ), collect affordable original art, or experience acupuncture treatment for pain relief or drug addiction were not enough incentive to visit Da Nang, how about doing a bit of surfing? The longest and most beautiful beach in all of Southeast Asia stretches from Da Nang's Son Tra Pennisula to the tourist town of Hoi An. This twenty mile (30km) long white sandy beach was the site of the famous China Beach R&R spot for GIs during the American War, as well as an international surfing competition in 1992. Despite the fact that Five Star resorts are popping up like mushrooms along the Da Nang/Hoi An corridor, surfers and other beach-lovers are few and far between. Most of the locals prefer to time their beach visits to the dawn and twilight hours, in order to avoid the effects of the intense tropical sun. (Just two hours of mid-day tropical sun on pale skin can produce a serious, second-degree burn.) If you plan to spend much time on the beach and in the surf, bring plenty of waterproof sun block! 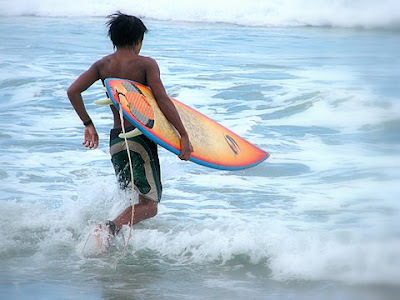 Otherwise, consider coming during the rainy season, between November and February when skies tend to be overcast and the waves are the biggest. The water here is relatively warm year-round, but you would probably be more comfortable in the winter months wearing at least a spring suit for surfing. Vietnam is, of course, a tropical country and it never gets very cold here but, when you're wet and the weather is breezy and overcast, it's easy to start shivering. This section of the coast is beach break. 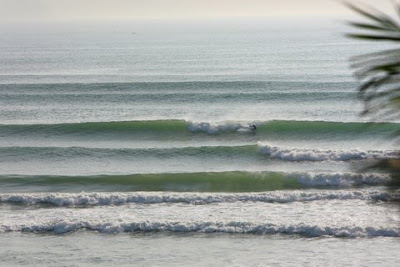 We have pretty consistently surfable waves beginning sometime in September and trailing off in May. During the summer months of June, July and August, the seas tend to be quite calm. Off-shore storms can be a source of wave action, stirring up the usually calm seas of August to yield a couple of days of good surfing or making the usually surfable November seas so rough that you might think twice about even walking on the beach! Up-to-date surf forecasts can be found here. A word of warning: Rip currents here can be strong and drownings do occur. Make sure you use a leash. If you do become separated from your board and are caught in a rip current, remember to swim parallel to the shore until you are out of the current before attempting to swim ashore.